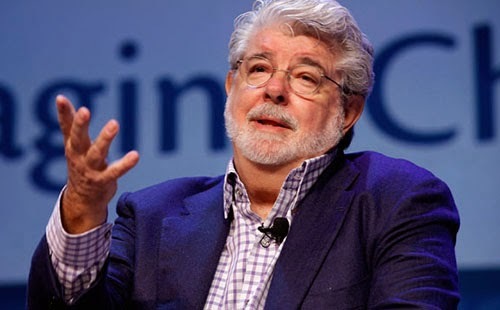 George Lucas Wants To Build Low Income Housing -- Says, "We Have Enough Millionaires"
Filmmaker George Lucas, known for his multi-billion dollar-generating Star Wars franchise, is planning to build low income housing in Marin County, Northern California where 7.7 percent of county residents live below the poverty line, but the average home price is nearly $1 million. The 224-unit affordable housing complex will reportedly be built on Grady Ranch, where his once-planned studio expansion would have been, and will allow development on 52 acres of land. He is also planning to build a workforce and senior residences, as well as a community center, pool, a micro-farm, and an orchard. Residents that want to apply for the housing must be senior citizens or families that make less than 80 percent of the area’s median income, which is $90,839. Initially, Lucas wanted to expand his filming studios in the area, but the local residents voted against it. Then, he made his first attempt to build affordable housing in the area, but area residents were also against these plans citing that it would only attract "drug dealers" and "lowlife". This led to the local government backing out, and it's key financial backing did not go through. "I'll just fund it myself"
But now Lucas has committed to the financing himself, and says he will fund the project with his own money - which will cost between $120 million to $150 million at the time. He comments, "If I'm not going to do what I wanted to do there, what can I do that would be really beneficial to this community?" He went on to emphasize the need for affordable housing in the county. "I wouldn’t waste my time or money just to try and upset the neighbors," he added. Lucas is also a big supporter of equal opportunities in education. His foundations, Edutopia and Lucas Education Research, showcase, develop and evaluate methods that profoundly impact the course of learning and lifelong achievement for students kingergarten through 12th grade.